Ball in The Bucket games are simple but harder then it looks.This game is to test your accuracy , get two ball in the bucket to win the game. Very interesting game , everyone love to play . Ball the bucket game in Delhi. You can play in team or individualy ,Every team or individual has to put two ball from four ball inside the bucket to win the game. Those who will win the game will move forward to next round and in the last winner will be decided. Ball in the bucket game on rent. 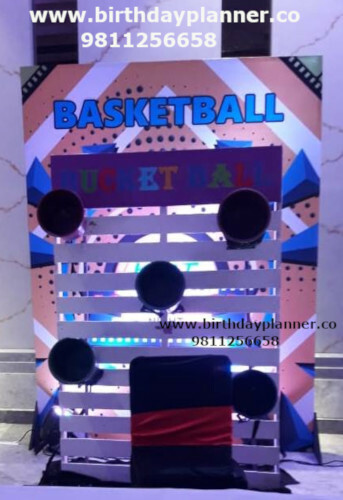 Different variety of games are available in ball in the bucket , just order the ball in the bucket game from birthday planner and let our coordinator handle every aspect of the game , you just enjoy the game and “Have Fun”. Bucket ball game another name is Ball in bucket game .Bucket ball game is simple yet much harder then it looks. Ball in the bucket game on rent. 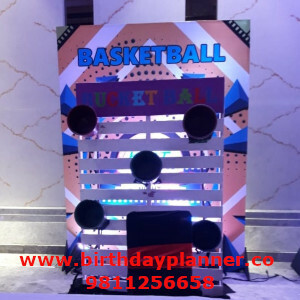 It’s game for all ages and ability.This game for the children’s party and adults party. Ball the bucket game for event . 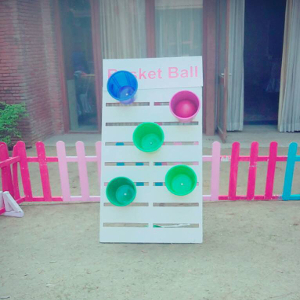 Bucket ball game not only the indoor game but also outdoor game.Bucket ball game full for fun and enjoy. Ball in the bucket game for rent. Players – Bucket ball is a ball game for at least six players divided two team. Equipment -5 Different colorful Bucket, Small ball/Foot ball and playing field. Rules – Each player on a team throws once, trying to throw the ball into the other team’s bucket. If a ball goes into a bucket, then the bucket is removed. Ball the bucket game for event . The player holding the ball may not make any steps but only pass the ball. Ball in the bucket game for rent. Direct body contest between the players is forbidden. The opposite team member are not allowed to touch your bucket. The ball may be shot in the direction of the bucket from any where on the field.For each time the ball lands in the bucket,the team gets the points. Ball in the bucket on rent . 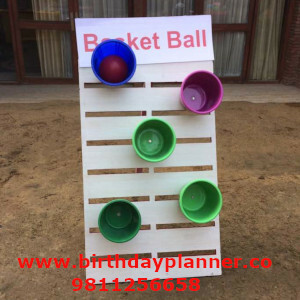 Similar games Jenga game , Balloon shooting , Leap the frog and even more.. Ball the bucket game in Delhi.